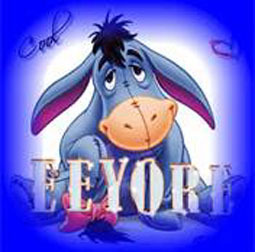 If you’re anywhere near Austin, Texas on Saturday, April 27, 2013 come to Pease Park in central Austin and celebrate Eeyore’s 50th AnnualBirthday Party. It’s a free and noncommercial event and open to everyone, according to organizer Scott Sexton, president of the Forest Foundation that puts on the party. This legendary spring jubilee honoring Eeyore, Christopher Robin and Winnie the Pooh’s sad but sweet donkey friend, is one of the events that prompted Austin City Council to formally adopt “Keep Austin Weird” as the city slogan. Begun in 1963 by several University of Texas students (no surprise! ), this unique celebration flourished during the 1960s and 1970s, when the drinking age in Texas was temporarily lowered to 18. The funky affair—outlandish costumes encouraged--has survived as one of Austin’s first signs of spring by retaining its original hippie flavor. Today it has evolved into a fun family event that provides a venue for non-profit groups to raise funds by selling drinks and food, including vegetarian items. There is no paid staff; everyone working there is a volunteer. The party starts at 11 a.m. and continues till dark. 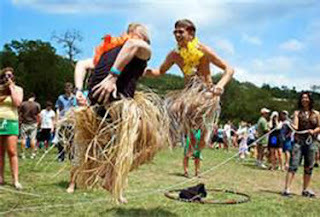 Old-fashioned maypole dancing is still a prime attraction with costume contests, live entertainment, face painting, and, of course, birthday cake to make it a fun occasion for both adults and children. The special children’s area is open from 11 a.m. till 4 p.m. Live music starts at noon and continues till 6 p.m.
Costumed partiers show off jump rope skills. Oh, and bring the dog; there is plenty of romping room in Pease Park. If you like entertainment that is a little weird, you’re an Austinite at heart, and you’ll love this bohemian celebration. “It’s fulfilling to know we’re doing something that helps retain the spirit of Austin, Sexton says. The park is a smoke-free environment.